Her defence requested a partial arrest to enable her to visit hospital. 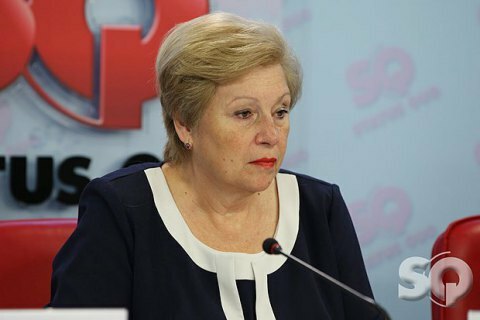 The Kharkiv regional court of appeals has refused to soften restrictions measures for former Communist Party MP Alla Aleksandrovska. Thus she will stay under 24-7 house arrest, Radio Liberty has said. One of her lawyers, Oleksandr Shadrin, said that she "badly required medical treatment" as her health condition was deteriorating. Her defence previously demanded that her house arrest be changed to partial to allow her to visit hospital during the daytime. On 20 October, Kharkiv's Kyivskyy district court extended her house arrest for another 60 days. She was arrested by the Security Service of Ukraine (SBU) in late June on suspicion of encroachment on the territorial integrity and inviolability of the state and bribery. According to the SBU, she and her son, who is now hiding in Russia, attempted to bribe the leadership and local councilors of Kharkiv Region so that they call on the president to change the constitution in favour of decentralization.